A 69-year-old male veteran with past medical history of emphysema presented with a new “knot” in his left thigh, two weeks after laminectomy and posterior fusion for severe lumbar stenosis. The patient had remained in the hospital with unexplained leukocytosis after his operation with a negative infectious workup. The “knot” described by the patient was a moderately firm 4x6cm mass in the anterior left thigh. The lesion was mobile and slightly tender with firm pressure and had been enlarging since surgery. An MRI of the left thigh and subsequent ultrasound guided biopsy were performed. At six-month follow up, the mass had self-resolved. MRI demonstrated a well-defined mass in the anterior left thigh within the belly of the vastus intermedius muscle, abutting the femoral cortex. 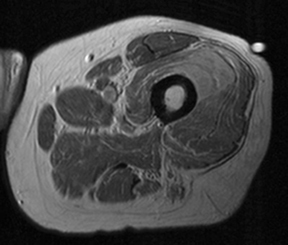 The lesion was isointense to skeletal muscle with similar appearance to muscle on T1 weighted images (Figure 1B) and homogeneously mildly hyperintense on proton density (PD) weighted images (Figure 1B). 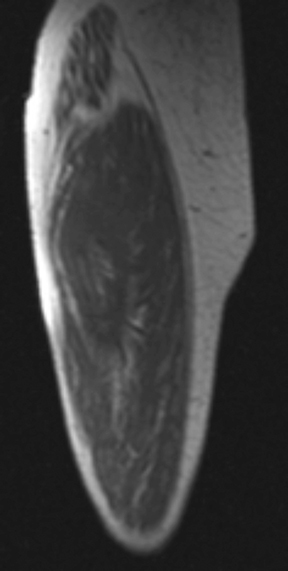 Muscle fibers can be seen continuing through the lesion on the coronal PD images (Figure 1C). The lesion appeared diffusely hyperintense on STIR (Figure 2). 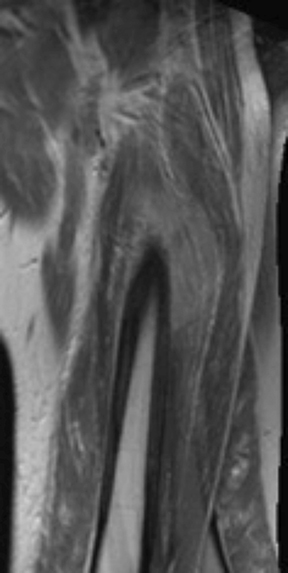 There was normal osseous signal of the underlying femur on all sequences, with no periosteal fluid or thickening. 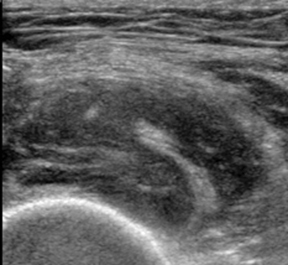 Transverse ultrasound image demonstrated the heterogeneously echogenic mass with traversing continuous muscle fibers (Figure 3A). 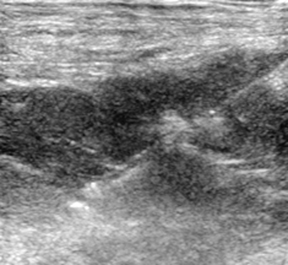 Longitudinal ultrasound image shows the core biopsy needle embedded within the hypoechoic thigh mass (Figure 3B). Slide review showed enlarged fibroblasts and myofibroblasts surrounding individual muscle fibers that created a “checkerboard” pattern. There were also ganglion-like cells with abundant amphophilic to basophilic cytoplasm (Figure 4). Proliferative myositis. Differential diagnosis included traumatic muscle injury with hematoma, infectious myositis, myositis ossificans, and soft tissue neoplasm. In one of the earliest and largest case series, proliferative myositis on gross pathology was described as a poorly marginated white to grey “induration” most prominent between the muscle bundles, leading to a trabeculated pattern.3 The lesions averaged 3.7 cm and were usually superficial, extending no more than 2-3 cm intramuscularly.3 Histologic findings of proliferative myositis include two primary features: infiltration of the muscle with large basophilic giant cells that resemble ganglion cells and proliferative fibroblasts primarily affecting the interfascicular connective tissue. Unlike other similar pathologies such as myositis ossificans or nodular fasciitis, the actual muscle was rarely involved and largely preserved. It is this pattern of normal muscle fascicles interspersed with infiltrating fibrous tissue that leads to the classic “checkerboard” pattern of proliferative myositis. Computed tomography (CT) is usually of minimal utility, since PM presents as a hypodense to isodense intramuscular mass with variable enhancement and poorly defined margins.6 Hasan et al, however, described a case of proliferative myositis that displayed linear reticulated hypodensities on CT characteristic of the “checkerboard-like” pattern.7 The features of proliferative myositis are best characterized with MRI. The mass appears hypo to isointense on T1-weighted sequences and hyperintense on T2- weighted sequences. Contrast enhancement can be variable but is typically homogeneous.8 Preserved muscle fibers can sometimes be seen within the mass, appearing as linear hypointense structures on T2-weighted imaging. Proliferative myositis, while rare, is an important consideration in the differential diagnosis of a rapidly enlarging soft tissue (in particular intramuscular) mass. The clinical history combined with suggestive imaging features can occasionally lead to the diagnosis. More commonly, however, tissue sampling should be performed to confirm benign entities such as PM while excluding malignancy, thus sparing the patient from radical surgery. Kern WH. Proliferative myositis; a pseudosarcomatous reaction to injury: a report of seven cases. Arch Pathol. 1960 Feb;69:209-216. Talbert RJ, Laor T, Yin H. Proliferative myositis: expanding the differential diagnosis of a soft tissue mass in infancy. Skeletal Radiol. 2011 Dec;40(12):1623-1627. Enzinger FM, Dulcey F. Proliferative myositis. Report of thirty-three cases. Cancer. 1967 Dec;20(12):2213-2223. 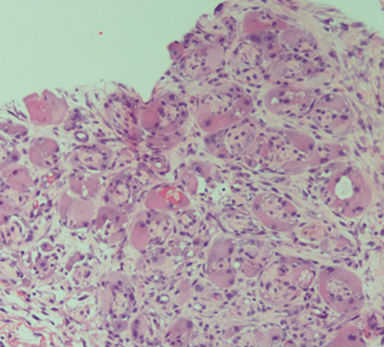 Chevalier X, Larget-Piet B, Gherardi R. Proliferative myositis as a complication of rheumatoid vasculitis. J Rheumatol. 1993 Jul;20(7):1259-1260. McComb EN, Neff JR, Johansson SL, Nelson M, Bridge JA. Chromosomal anomalies in a case of proliferative myositis. Cancer Genet Cytogenet. 1997 Oct 15;98(2):142-144. Pagonidis K, Raissaki M, Gourtsoyiannis N. Proliferative myositis: value of imaging. J Comput Assist Tomogr. 2005 Jan-Feb;29(1):108-111. Yiğit H, Turgut AT, Koşar P, Astarci HM, Koşar U. Proliferative myositis presenting with a checkerboard-like pattern on CT. Diagn Interv Radiol. 2009 Jun;15(2):139-142. Wlachovska B, Abraham B, Deux JF, Sibony M, Marsault C, Le Breton C. Proliferative myositis in a patient with AIDS. Skeletal Radiol. 2004 Apr;33(4):237-240. Lacout A, Jarraya M, Marcy PY, Thariat J, Carlier RY. Myositis ossificans imaging: keys to successful diagnosis. Indian J Radiol Imaging. 2012 Jan;22(1):35-39. Parikh J, Hyare H, Saifuddin A. 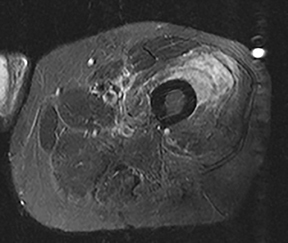 The imaging features of post-traumatic myositis ossificans, with emphasis on MRI. Clin Radiol. 2002 Dec;57(12):1058-1066. Shi J, Lewis M, Walsworth MK, Modaressi S, Masih S, Chow K. Proliferative myositis. Appl Radiol. 2018;47(1):43-45. Prepared by Dr. Shi while a Radiology Resident; Dr. Lewis while an Assistant Professor of Pathology; Dr. Walsworth while an Interventional Radiologist and Assistant Professor; Dr. Modaressi while a Radiologist and Associate Professor; Dr. Masih while a Radiologist and Professor; and Dr. Chow while a Radiologist and Associate Professor at Greater Los Angeles Veterans Affairs Healthcare System, and David Geffen School of Medicine at UCLA, Los Angeles, CA.